Until last weekend, I had never visited the best preserved long barrow in the county closest to where I live – Coldrum Long Barrow, in North Kent. 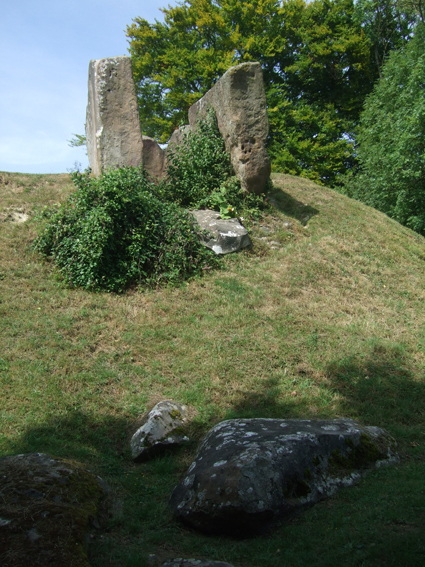 I knew about the Neolithic stones, which are part of a group called the Medway Megaliths, and have posted some lovely photos of them that other people have taken, but for some reason had not gone there myself. Wow! Had I been missing out on an amazing experience. The name 'Coldrum', which comes from a now-demolished nearby farm and is possibly derived from the old Cornish word 'galdrum', means 'place of enchantments'. That is totally apt – the place really does feel enchanted. 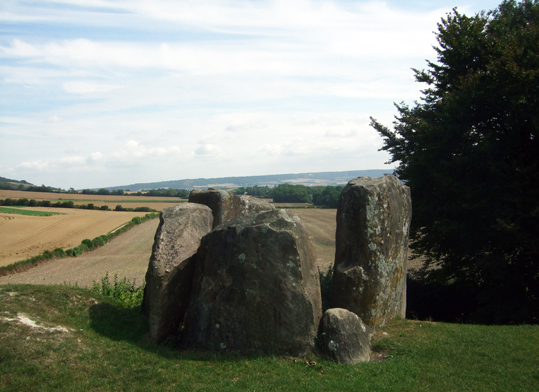 From high up on the North Downs, the ancient tomb offers stunning views over Kentish fields and is a place where pagans today watch the sun rise on the solstices. According to the National Trust, which manages the site, "Every year, on the 1 May at dawn the Hartley Morris Men visit the stones to 'sing up the sun'." I guess that is something to either attend or avoid depending on whether you enjoy Morris dancing. I visited Coldrum Long Barrow with friends on a sunny Saturday in August, the sky was blue and the fields were golden with ripe grain. I wished we had brought a picnic as it would have been a perfect spot to rest and enjoy the fruits of the harvest. There was one other person there too – a man from Rochester who said that he frequently went to Coldrum to soak up the lovely energy of the place. 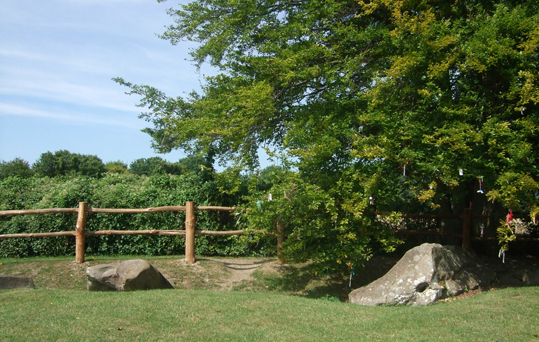 The National Trust has ringed the stones in a wooden fence, which seems to act more as a boundary marker than a barrier for those who want to enter. Many people have evidently crossed into the sanctuary within. 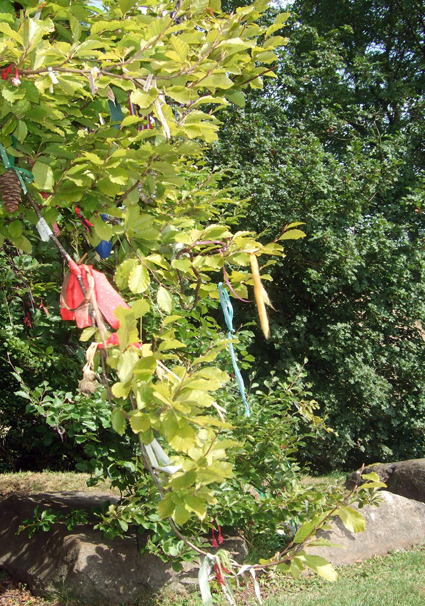 Coloured ribbons had been hung from the branches of an overhanging beech tree and the remains of a camp fire could be seen in the middle of the grass. These didn’t actually seem to detract from the energy of the place, and I sensed that the ribbons and the fire were the work of people who were trying to honour the place in their own way, but I do think it would have been better undisturbed. Although ribbons tied to trees can look pretty when there aren’t too many of them and they can easily be removed, the fire had burned the ground, which would take a long time to recover. It is far better if people take home everything they bring with them and, if they choose to light fires, only do so in something that doesn’t leave a mark – a portable fire bowl, for example. Coldrum Long Barrow is a half-mile walk along a well signposted footpath from a small car park at Trottiscliffe, West Malling, in Kent. If you are going by car, set your sat nav for ME19 5EG. After visiting Coldrum, I went to find Kit’s Coty, another of the Medway Megaliths. I’ll be blogging about that in the next few days.